Gloria Frances Caldwell, 75, died Wednesday, September 2, 2015 at Hendrick Medical Center after a brief illness. A celebration of Frances life will take place at a later date. Arrangements are by Starbuck Funeral Home. Frances was born August 17, 1940 in Abilene, Texas to J.B. and Sebrenya Caldwell. She worked many years at Timex in Abilene. 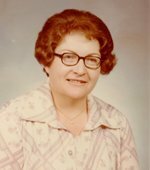 She was the surgical secretary with West Texas Hospital then went into private duty nursing. She was in the first graduating class of Jim Ned High School at Tuscola in 1958. Survivors include two sisters, Carol Caldwell and Kathy Caldwell both of Thorndale; brother, David Caldwell and wife Linda of Gordon. She was preceded in death by her parents; and sister, Mary Cotton.